Recombinant fragment, corresponding to a region within amino acids 69-346 of Human KLF5 (Uniprot ID: Q13887). A431, H1299, HeLa and HepG2 whole cell lysate (ab7900); Mouse ESC D3 cells. Our Abpromise guarantee covers the use of ab137676 in the following tested applications. WB 1/500 - 1/3000. Predicted molecular weight: 51 kDa. Transcription factor that binds to GC box promoter elements. Activates the transcription of these genes. Expressed only in testis and placenta. KLF5 (also known as basic transcription element-binding protein 2, BTEB2, and intestine enriched krüppel-like factor, IKLF), appears to play a central role in the regulation of intestinal epithelial renewal in both the small intestine and colon. 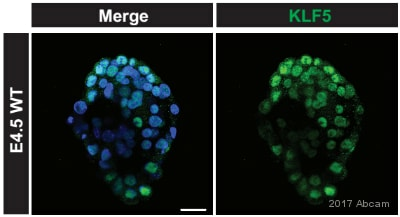 KLF5 also regulates adipocyte differentiation. IHC- Wholemount of E3.75 mouse blastocyst labelling KLF5 with ab137676. Embryos were fixed with 4% paraformaldehyde; washed with PBS + 0.1% Triton X-100 at room temperature and permeabilized with PBS + 0.5% Triton X-100 + 100mM Glycine for 5 minutes at room temperature. Blocked with PBS + 2% horse serum for 1 hour at room temperature. Sample was incubated with primary antibody (1/100) for 18 hours at 4°C. An Alexa Fluor® 488 Donkey anti-rabbit was used as the secondary antibody at 1/500 dilution. Immunofluorescence analysis of paraformaldehyde-fixed Mouse ESC D3 cells labelling KLF5 using ab137676 at 1/200 dilution. 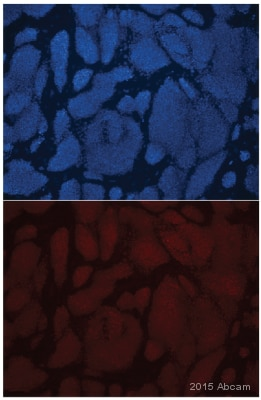 Lower image shows cells co-stained with Hoechst 33342. Publishing research using ab137676? Please let us know so that we can cite the reference in this datasheet.